This component defines nodes for using high-level shading languages available on modern graphic cards. See also X3D specification of the Programmable shaders component. This movie shows GLSL shaders by our engine. For complete demos of features discussed here, see the shaders subdirectory inside our VRML/X3D demo models. You can open them with various Castle Game Engine X3D tools, in particular with view3dscene. The GLSL function reference. Be careful: the reference linked here describes both GLSL and OpenGL API. You can ignore the functions named glXxx, they are part of the OpenGL API, and they not useful to a shader author. GLSL description at Wikipedia and GLSL description at Khronos wiki. If you're interested in shaders, we strongly encourage you to try also our compositing shaders extensions for X3D, with Effect and related nodes. They allow to write shader code that can cooperate with standard browser rendering, and define rendering effects that can be easily reused and combined. You can directly write the shader source code inside an URL field (instead of putting it in an external file). The best way to do this, following the standards, is to use the data URI. In the simplest case, just start the URL with "data:text/plain," and then write your shader code. In case of the X3D XML encoding, you can also place shader source code inside the CDATA. As an extension (but compatible at least with InstantPlayer) we also recognize URL as containing direct shader source if it has any newlines and doesn't start with any URL protocol. But it's better to use "data:text/plain," mentioned above. The ProximitySensor node above is useful to make time start ticking from zero when you open VRML/X3D, which makes the float values in MyTimer.elapsedTime increase from zero. Which is usually useful, and avoids having precision problems with huge values of MyTimer.time. 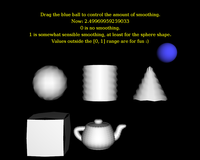 See notes about VRML / X3D time origin for more details. Most field types may be passed to appropriate GLSL uniform values. You can even set GLSL vectors and matrices. You can use VRML/X3D multiple-value fields to set GLSL array types. 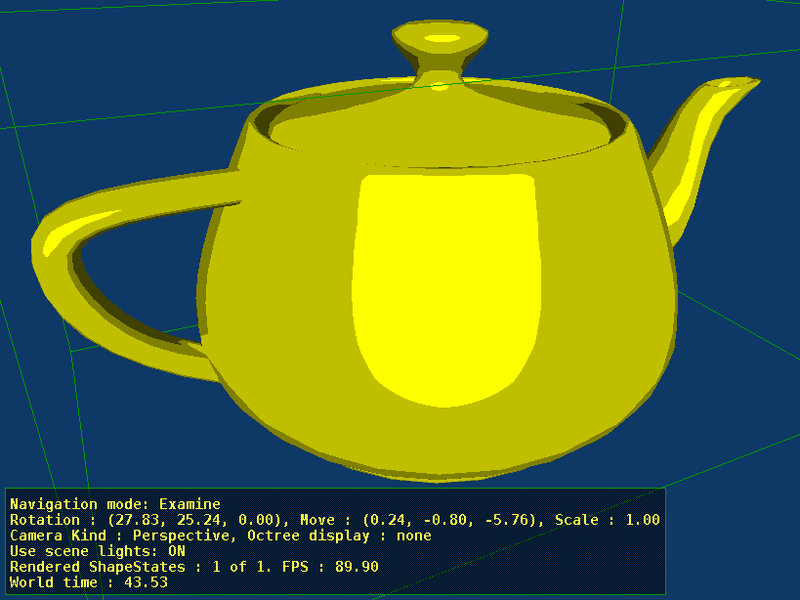 We support all mappings between VRML/X3D and GLSL types for uniform values (that are mentioned in X3D spec). TODO: except the (rather obscure) SFImage and MFImage types, that cannot be mapped to GLSL now. You can also specify texture node (as SFNode field, or an array of textures in MFNode field) as a uniform field value. Engine will load and bind the texture and pass to GLSL uniform variable bound texture unit. This means that you can pass in a natural way texture node to a GLSL sampler2D, sampler3D, samplerCube, sampler2DShadow and such. The simplest demo of using this too combine 2 textures in a shader is inside demo-models/shaders/two_textures.x3dv. This demo, along with many more, are inside our our VRML/X3D demo models (look inside the shaders/ subdirectory). When using GLSL shaders in X3D you should pass all needed textures to them this way. Normal appearance.texture is ignored when using shaders. However, in our engine, we have a special case to allow you to specify textures also in traditional appearance.texture field: namely, when ComposedShader doesn't contain any texture nodes, we will still bind appearance.texture. This e.g. allows you to omit declaring texture nodes in ComposedShader field if you only have one texture, it also allows renderer to reuse OpenGL shader objects more (as you will be able to DEF/USE in X3D ComposedShader nodes even when they use different textures). But this feature should not be used or depended upon in the long run. Note that for now you have to pass textures in VRML/X3D fields (initializeOnly or inputOutput). TODO: Using inputOnly event to pass texture node to GLSL shader temporarily does not work, just use initializeOnly or inputOutput instead. You can also pass per-vertex attributes to your shader. You can pass floats, vectors and matrices. The way do use this of course follows X3D specification, see FloatVertexAttribute (API reference), Matrix3VertexAttribute (API reference), Matrix4VertexAttribute (API reference) nodes. You can place them in the attrib field of most geometry nodes (like IndexedFaceSet). Example attributes.x3dv, showing how to pass elevation grid heights by the shader attributes. We support geometry shaders (in addition to standard vertex and fragment shaders). To use them, simply set ShaderPart.type to "GEOMETRY", and put code of your geometry shader inside ShaderPart.url. What is a geometry shader? A geometry shader is executed once for each primitive, like once for each triangle. Geometry shader works between the vertex shader and fragment shader — it knows all the outputs from the vertex shader, and is responsible for passing them to the rasterizer. Geometry shader uses the information about given primitive: vertex positions from vertex shader, usually in eye or object space, and all vertex attributes. A single geometry shader may generate any number of primitives (separated by the EndPrimitive call), so you can easily "explode" a simple input primitive into a number of others. You can also delete some original primitives based on some criteria. The type of the primitive may be changed by the geometry shader — for example, triangles may be converted to points or the other way around. Another example of geometry shaders: geometry_shader_fun_smoothing. We have also a more flexible approach to geometry shaders as part of our compositing shaders extensions. The most important advantage is that you can implement only the geometry shader, and use the default vertex and fragment shader code (that will do the boring stuff like texturing, lighting etc.). Inside the geometry shader you have functions geometryVertexXxx to pass-through or blend input vertexes in any way you like. Everything is described in detail in our compositing shaders documentation, in particular see the the chapter "Extensions for geometry shaders". Our implementation of geometry shaders is directed only at geometry shaders as available in the OpenGL core 3.2 and later (GLSL version is 1.50 or later). Earlier OpenGL and GLSL versions had geometry shaders only available through extensions: ARB_geometry_shader4 or EXT_geometry_shader4. They had the same purpose, but the syntax and calls were different and incompatible. For example, vertex positions were in gl_PositionIn instead of gl_in. The most important incompatibility was that the input and output primitive types, and the maximum number of vertices generated, were specified outside of the shader source code. To handle this, an X3D browser would have to do special OpenGL calls (glProgramParameteriARB/EXT), and these additional parameters must be placed inside the special fields of the ComposedShader. InstantReality ComposedShader adds additional fields geometryInputType, geometryOutputType, geometryVerticesOut specifically for this purpose (see also the bottom of InstantReality shaders overview). See simple example on Wikipedia of GLSL geometry shader differences before and after GLSL 1.50. We have decided to not implement the old style geometry shaders. 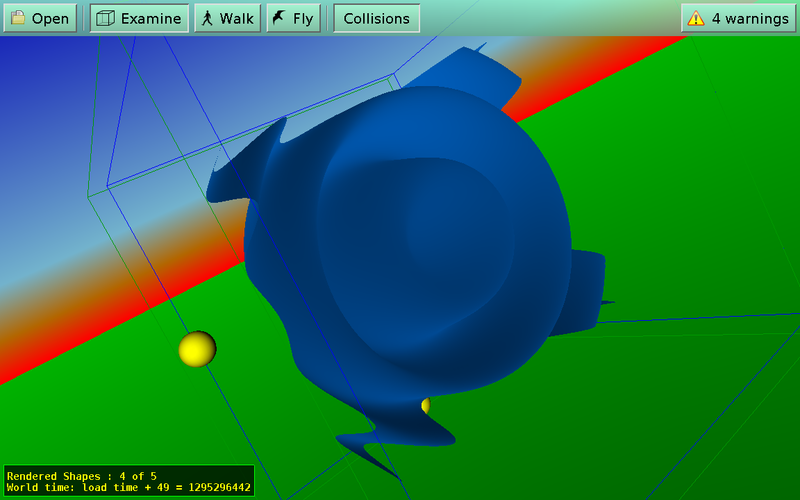 The implementation would complicate the code (need to handle new fields of the ComposedShader node), and have little benefit (usable only for old OpenGL versions; to make geometry shaders work with both old and new OpenGL versions, authors would have to provide two separate versions of their geometry shaders). So we just require new geometry shaders to conform to GLSL >= 1.50 syntax. On older GPUs, you will not be able to use geometry shaders at all. 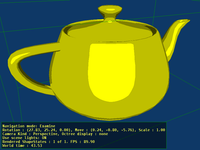 The engine can generate GLSL shaders (as X3D ComposedShader node) to render your shapes. This happens automatically under the hood in many situations (for example when your shapes require bump mapping or shadow maps, or when you compile for OpenGLES >= 2). You can run view3dscene with a command-line option --debug-log-shaders and force rendering using shaders (for example by menu option View -> Shaders -> Enable For Everything) to view the generated GLSL code for your shaders in the console. You can even copy them, as a ComposedShader node, and adjust, if you like.